The Ocean Systems Rackmount is our most powerful and flexible workstation solution, with optional dual 10-Core CPUs and blazing fast storage. 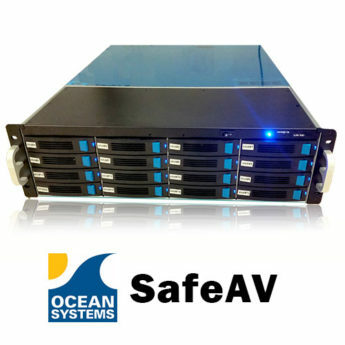 Ocean Systems has been first to market with a wide range of innovative, powerful and easy-to-use sytems and solutions for processing and managing video, image and audio evidence. For nearly 20 years our systems have consisently been chosen by Government, Law Enforcement & Military users operating in some of the most demanding computer environments. We design solutions to meet your specific needs and budget. The newly designed Ocean Systems Rackmount is quieter than ever. Now with Whisper Technology. The Rackmount™ is a professional rack-mountable solution, not simply a tower solution turned on its side. As such, all ports and bays are fully accessible and in their proper orientation. Sturdy, compact and clean with thick gauge steel construction this system will install easily into any standard 19″ rack cabinet. If portability becomes important, we can upgrade your Rackmount system to The FlyAway. Positive Pressure Ventilation – ensuring components inside are cool. Sliding Rack Rails – providing you easy access. Security – Transparent, lockable “Front Access Door” which secures power and peripheral access. Security – Optional removable boot drive for classified editing. Is SafeAV faster than my NVMe SSD storage? How can I add expandable, High Speed RAID storage to my system? How do I identify my Graphics Card make/model? How do I clear my system Event Log?